WCC sought out sources of funding for this Seven Hills Trail. With leadership and support from former Seven Hills Councilman Scott Curtis, an initial grant was secured from the Northeast Ohio Areawide Coordinating Agency (NOACA) to fund the trail section extending east from Broadview Road, just north of Pleasant Valley Road. Councilman Curtis believed that because there were relatively few area sidewalks, the trail would provide additional recreational opportunities for residents. Beginning beside Panera Bread, continuing past Seven Hills City Hall and Recreation Center, extending along the First Energy power line corridor past the soccer fields and behind Hillside Junior High School, and along the residential area to Cricket Lane—the one-mile trail route begins a convenient trail linkage to both West Creek Reservation and Cuyahoga Valley National Park for Seven Hills residents. Because most of the property was already owned by Seven Hills and First Energy, and with additional funding from NOACA, then City Engineer Mark Papke succeeded in completing the $828,000 project at a cost to Seven Hills of only $165,660. 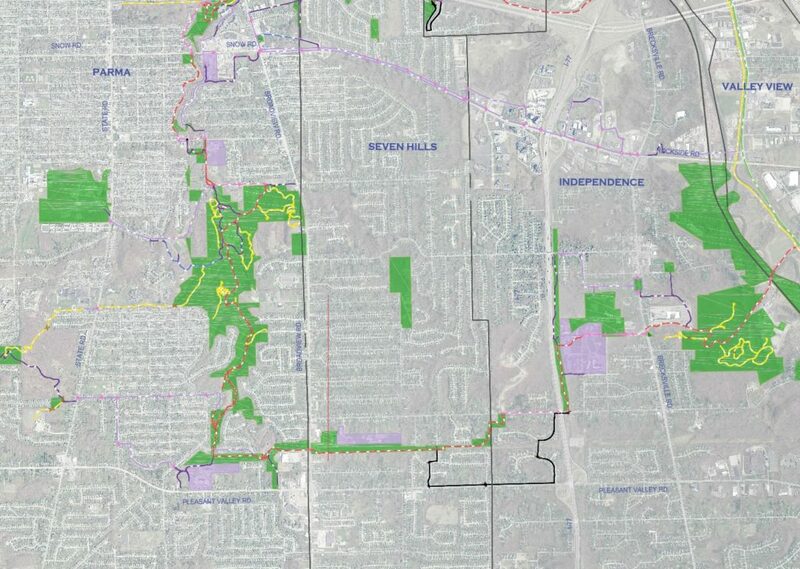 In 2007, Seven Hills officials received praise from WCC for being the first community to complete an official West Creek Greenway segment beyond West Creek Reservation. The project included all necessary site preparation, paving, landscaping, benches, and trash receptacles. Below is a map of the proposed trail in red.